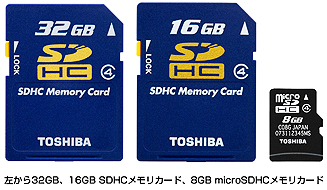 Toshiba Japan has announced worldwide distribution of both 16 and 32GB high capacity SD (SDHC) memory cards – the 16GB card ships next month, with the 32GB version coming out in 2008. In addition, they have released an 8GB microSDHC memory card. The cards will sell for about $350 US for the 16GB and twice that for the 32GB card. The microSD card will cost about $175. The high-speed “Class 4” SD cards conform to the version 2.0 standard and loads in a blazing 6MB/second. And the micro card has something of it’s own to crow about, being able to store about 139 hours of music at 128kbps which is ideal for smart cellphones that double as MP3 players. With even Digital SLR cameras looking to the smaller SD cards in an effort to make their cameras lighter and faster, the 32GB and 16GB cards will be most popular, especially with 6MB write speeds which will cause burst mode photography to be in near real time. But it’s also telling for the MP3 player world which has rumored to be going more towards the flash based drives and away from the portable hard drives. How long will it be before we see a 32GB iPod Nano? Or will the iPhone come out with sizes like that within the year?